...Gameknight999, who is forced to live out a real-life adventure inside a digital world in THE INVASION OF THE OVERWORLD by Mark Cheverton, an action-packed tribute to Minecraft. Win a set of INVASION OF THE OVERWORLD by Mark Cheverton for your book club. Enter to win by emailing the author. Please write "KidsBookclubbing" in the subject line. You know what I love to do...play MINECRAFT with my son. But the day when he was cyber bullied on his own server, everything changed for me. That's when I wrote my first Minecraft novel, INVASION OF THE OVERWORLD. I wanted to teach him something about bullying, but at the same time use the awesome world of Minecraft to deliver the story. So I wrote about his Minecraft character, Gameknight999 as he gets sucked into Minecraft by his father's invention, and unintentionally drawn into a war. Th e NPCs of the Overworld are battling for their lives against an army of monsters led by the evil king of the enderman, Erebus. Only Gameknight999 can save them! Kids all over the country are praising this book, propelling it to the New York Times Bestseller list. Come join in on the adventure. I have six Minecraft novels out now and more coming soon. "This was an Xmas gift for my 11-yr old son. Out of everything he got this was his favorite. I'm not kidding, he started reading the book right after opening it. I had to verbally remind him when it was his turn to open his next present. When all the gifts were opened he went to the bedroom and finished the book in one sitting. In an age when kids are glued to a myriad of screens and gadgets, I cherish the moments when mine opts for a book instead. Really hoping there's a series evolving here." "I write very few reviews, but when an author really knocks one out of the park, I like to give kudos where they are due! My 13 year old son, he of Minecraft / Black Ops / Terraria worlds, would not put this book down. He is eagerly awaiting the two sequels, and not only read the book cover to cover, but then went back and RE-READ passages! I've never seen him do that with any book, and he does read a pretty good amount. Nice job, Mark!!" If you could go into any computer game and play it out, for real, what would you choose? I think I'd pick Super Mario Galaxy 2. Gameknight999 is a bully at the beginning of the book, but at the end he is a hero. What do you think happened in the story that helped him to stop bullying and think about other people? Why do you think Erebus wanted to escape from Minecraft. What would he really do if he escaped into the real world? And what do you think people would have to do to stop the monsters when they reached the physical world? Do you think, at the end of the book, that Gameknight999 earned the respect of the other users during the underground battle at The Alamo, or do you think they still hate him? What do you think the users said about him after the battle? To find out more about the Gameknight999 series, share your MInecraft images and/or videos, read the author's blog and listen to audio recordings, visit the author's website. And you can follow him on Facebook and Twitter, too. Author call-in information: Mark Cheverton is happy to call-in to or email with your club. Email him to submit your request. Win a set of BACKLASH by Sarah Darer Littman for your book club. Enter to win by emailing the author. Please write "Kidsbookclubbing" in the subject line. She thought that Christian liked her, that he was finally going to ask her to his school's homecoming dance. They've been talking online for weeks, so what's with the sudden change? And where does he get off saying horrible things on her wall? Even worse -- are they true? It's been a long time since Lara's felt this bad, this depressed, this ugly. She's worked really hard to become pretty and happy -- and make new friends after what happened in middle school. Bree used to be best friends with overweight, depressed Lara, but constantly listening to Lara's issues got to be too much. Secretly, Bree's glad that Christian called Lara out. Lara's not nearly as amazing as people think. 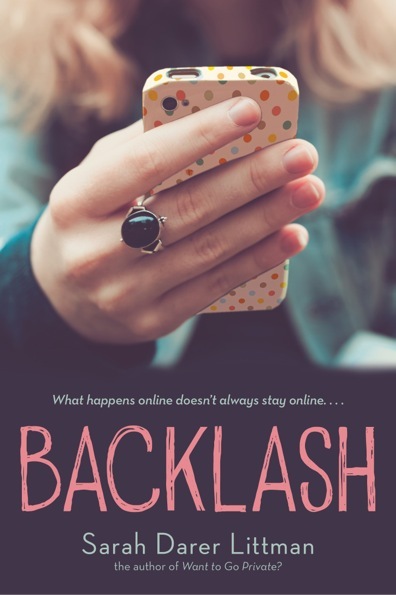 I was inspired to write BACKLASH after reading news stories about different cyberbullying incidents and the online vigilantism that occurred in the name of making the bullies "pay." As bullying continues to play out more often in the virtual world, it's important to remember there are human beings experiencing real life pain, often with tragic consequences. It is my hope that this story might start some thoughtful conversations around how we can rethink attitudes in our schools, our homes, and our communities. "Littman pens a raw, frighteningly realistic, and absorbing look at cyberbullying and the damaging effects of airing private trauma in a public forum. By telling the story from the shifting viewpoints of key characters, Littman honestly examines the conflicting ways people can view a single situation." "A powerful and credible story that illustrates the perils of immature decisions and explores the wide-reaching ripple effect of destructive actions thought by the perpetrators as 'fun'...The depression and bullying are handled realistically without sugarcoating, and fortunately, consequences are applied. An excellent choice for any anti-bullying campaign." 1. At the dramatic opening of BACKLASH, Lara thinks, "The words on the screen don't make sense. They can't." How does reading those words set the stage for Lara's choice to harm herself? 2. While watching the EMTs work on her sister, Sydney thinks, "I can't say how many times I've wished that I were an only child. But now I'm whispering frantic prayers, over and over, that I won't be" (p. 9). Considering Sydney's reflections on her relationship with Lara, what do we learn about how she feels about her sister? Do you think her attitude is particularly unusual? Why or why not? 3. What does Bree's determination to post the pictures of an unconscious Lara indicate about Bree's state of mind? Do you think it's common to feel compelled to seek out "likes" at any cost as a way to get attention? 4. In what ways do Lara and Bree's parents influence the behavior of their daughters? Explore how each of these adults acts and reacts to the situation as it unfolds. 5. Predict how each member of Lara and Bree's family will ultimately be changed by the events that transpire in BACKLASH. For a full discussion and activity guide, resources about peer victimization/bullying/cyberbullying, information about the author and to contact her, visit her website. Author call-in information: Sarah Darer Littman is happy to call-in to or Skype with your club. Email her to submit your request.